BitTorrent, the company, continues its push to prove that the BitTorrent, the protocol , isn’t just for online piracy anymore. The company’s latest product tease is a new instant messaging service predictably dubbed BitTorrent Chat. The new product is currently in a “pre-alpha stage,” according to the company, meaning BitTorrent Chat isn’t ready for mass consumption. At the moment, the best you can do is sign-up for a mailing list to receive notifications about BitTorrent Chat and when it will be available to try out. The new service will of course rely on the BitTorrent protocol to deliver messages over an encrypted peer-to-peer network. As part of its marketing hype, BitTorrent is pointing out that its peer-to-peer chat won’t need to store your chats on a third-party’s servers like the chat platforms from Facebook or Google do. “Our goal is to ensure that your messages stay yours: private, secure, and free,” the company said in a recent blog post announcing BitTorrent Chat. The downside of that approach, however, means you will probably have to rely on your own back-up and storage practices to maintain a log of all your chats—assuming you want to do that in the first place. Facebook and Google on the other hand take care of backing up your data for you and then make it available across your devices as you need it. 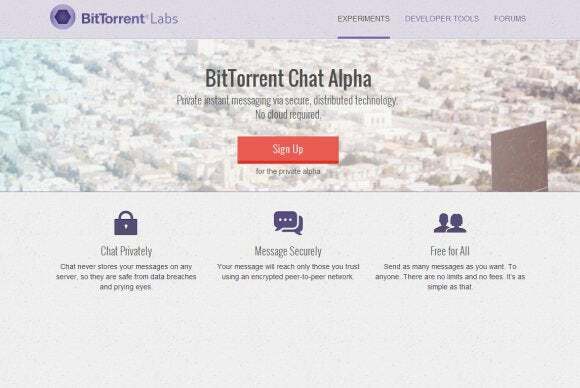 The reveal of BitTorrent Chat comes as concerns about privacy continue to mount in the face of the U.S. National Security Agency’s reported surveillance activities. BitTorrent also points to data breaches by malicious hackers as reason enough to want to keep your chats secure and off of third-party servers. For anyone concerned about securing their instant messaging chats, several solutions already exist. You could use a multi-account IM program such as Pidgin and install the Off-the-record messaging plugin. That way any other user with an OTR-compatible chat client can chat with you over an encrypted channel. By default, OTR messages aren’t logged, but you can configure your chat client to log your conversations. Another alternative is Cryptocat, a chat platform that lets you have encrypted conversations with other Cryptocat users. Cryptocat is still under development, however, so users should expect a few hiccups such as the bug in July that made some messages more vulnerable to snooping. BitTorrent Chat development follows the introduction of BitTorrent Sync, a distributed file sync service that became available to the public in July.